Delivery | Dunster House Ltd.
We like to make sure that our uPVC windows and doors get to you as quickly as possible and in first class condition. So, we use our own fleet of delivery vehicles, to make sure that you receive them safely and securely, rather than use a third party courier. 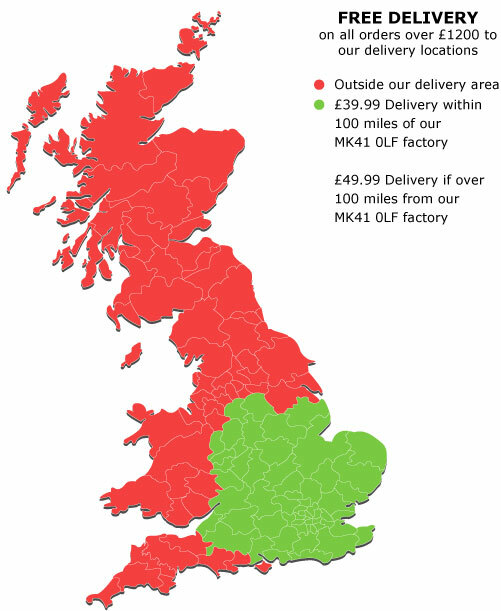 As we complete the manufacture of your order at our factory in Bedford, England, we base the delivery charge on the distance to your required location from there. So, the nearer you are to our Bedford base the cheaper the delivery charge will be. The delivery charge is broken down into simple to understand delivery bands – see the map below for more details.